The U.S. Occupational Safety and Health Administration (OSHA) has issued a December 9, 2016 response to the joint industry petition filed on May 24, 2016 by CPDA, the Agricultural Retailers Association, the International Sanitary Supply Association, and the Society of Chemical Manufacturers and Affiliates requesting that the Agency issue a Direct Final Rule to amend its 2012 Hazard Communication Standard (HCS 2012). Under the existing regulations, all products bearing 1994 or 2012 compliant labels when initially received in a warehouse are subject to relabeling within six months of obtaining new hazard information before they can be shipped from the warehouse. CPDA and the other petitioners sought to have OSHA clarify that when firms handling products in sealed containers in warehouses become aware of significant new chemical hazard information they may comply with HCS 2012 by the electronic transmission of an updated label to downstream entities in a manner similar to how updated safety data sheets are transmitted. 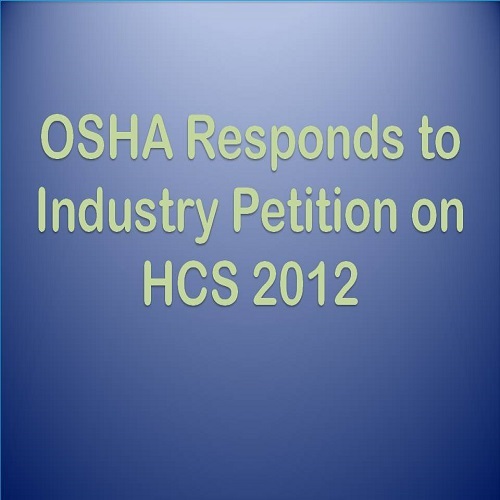 Unfortunately, OSHA denied the request for a Direct Final Rule maintaining that the remedy sought by the petitioners constituted a “multifaceted” change to the HCS 2012 that would impact not only manufacturers and distributors, but workers as well and hence would require a full rulemaking with notice and comment. However, the Agency did express its willingness to consider CPDA’s concerns as OSHA begins the process of initiating a rulemaking to align the HCS 2012 with the sixth revision of the GHS. Specifically, OSHA acknowledged CPDA’s concerns with regard to the significant chemical exposure and ergonomic risks that workers would be subjected to if required to re-label products previously packaged for shipment and stored in warehouses. Furthermore, OSHA recognized the concerns articulated by CPDA that most warehouses lack the automated equipment necessary to re-label these products in an ergonomically safe and effective manner. These issues were raised by CPDA President Sue Ferenc during a November 16, 2016 “listening session” conducted by OSHA for purposes of receiving stakeholder input as the Agency prepares to begin its rulemaking to revise the HCS 2012. As a follow-up to the November meeting, CPDA is preparing comments for submission to OSHA in early January on the relabeling impacts of HCS 2012 as it is currently written, including its associated ergonomic and worker safety risks, estimated compliance costs, and the regulatory impacts of allowing revised labels to appear on products manufactured (rather than shipped) six months after learning of significant new hazard information. To read OSHA’s December 9, 2016 response to the joint industry petition, click here.